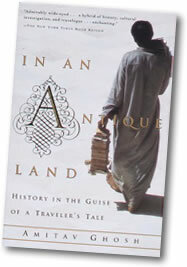 The cover proclaims IAAL "History in the guise of a traveller's tale," and the multi-generic book moves back and forth between Ghosh's experience living in small villages and towns in the Nile Delta and his reconstruction of a Jewish trader and his slave's lives in the eleventh century from documents from the Cairo Geniza. In the 1980s Amitav Ghosh moved into a converted chicken coop. It was on the roof of a house in Lataifa, a tiny village in Egypt. During the day he poured over medieval letters sent to India from Cairo by Arab merchants. In the evenings he shut out the bellowing of his fat landlord by turning up the volume of his transistor radio and wrote stories based on what he had seen in the village. The story of Khamees the Rat, the notorious impotent (already twice married); of Zaghloul the weaver determined to travel to India on a donkey; of one-eyed Mohammad, so obsessed with a girl that he spent nights kneeling outside her window to listen to the sound of her breathing; of Amm 'Taha, part-time witch, always ready to cast a spell for a little extra money; and, of course, the story of Amitav Ghosh himself, known in the village as the Indian doctor, the uncircumcised, cow-worshipping kaffir who would not convert to Islam. This book is the story of Amitav Ghosh's decade of intimacy with the village community. Mixing conversation and research, imagination and scholarship, it is also a charged, eccentric history of the special relationship between two countires, Egypt and India, through nearly ten centuries of parochialism and sympathy, bigotry and affection.